Comet 209855A. Red 3/4" Pucks for 44C Magnum Drive Clutch. Sold as 3 Pack. Home > Comet Clutches and Parts > Comet 203039A - Green Compression Spring for 40/44 Series Comet Industries Drive Clutch. > Comet 209709A. Model 44C "Magnum" Drive Clutch. 3/4" Bore. 3/16" keyway. > Comet 211573A. White Garter Spring for 44C MAGNUM Drive unit. > Comet 209706A. Comet Industries 44 Magnum Series Drive Clutch. 1-1/8" Bore. > Comet 209406A. 3-Pack of “White” Solid Puck Kit > Comet 209855A. RED 3/4" Pucks. Set of 3. Comet 44 Magnum Series Drive Clutch. 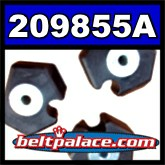 Comet 209855A Pucks for Comet 44C Drive Clutch. Sold as 3 Pack. Comet 209855A. Red 3/4" Pucks for 44C Magnum Drive Clutch. Sold as 3 Pack. Fits Models: Comet 209709A (3/4" Bore), 209418A (1" Bore), 209706A (1-1/8" Bore). The Comet 203785 (A-DF) Go Kart Belt is exact replacement for Comet Industries belt 40-85/DF. Replaces OEM Comet 40/44 Series. Torq-a-verter belt. Measurements: 7/8” Inch Top Width (.875 inch) x 33-7/8” (33.87) Inch Length. Symmetric Cogged belt. A popular size ATV belt, Go Cart belt, Golf Cart drive belt, People Mover clutch belt, and Mini-Bike drive belt. Manco 12346, Manco 12346 Belt, Carter Brothers. G721. 12-13057 Belt. Comet 209406A. 3-Pack of “White” Solid Puck Kit for 44C Series Comet Industries Drive Clutch.